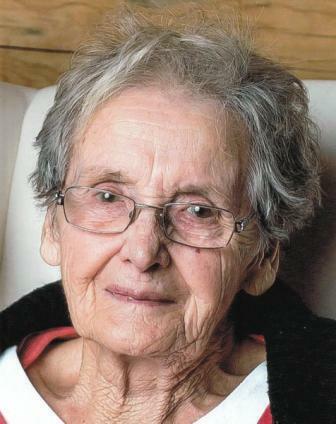 After spending 4-1/2months in hospital, Ida passed away peacefully with a long time family friend and Hospice volunteer, Ella Greffard by her side in Forest View Place, Clearwater, BC. Ida was an inspirational, courageous role model for everyone who met her. She leaves a huge void in all our hearts. RIP, Ida. and daughter, Tina (Laurie) Brewer from Mcleese Lake, as well as several grandchildren and great-grandchildren. husband Sky Buck, and Baby Buck in 2012, and brothers Steve and Bud Arnold. Ida and Emil were married on October 14, 1944 in Kuroki, Saskatchewan. Ida and Emil had 4 sons and 2 daughters. The family grew big vegetable gardens on the home property and provided vegetables for sale at Pratt’s General Store (near the old Thompson River Bridge) and Greenwood’s General Store (at the bottom of Stegg’s Hill).During the summer, Ida was a shepherd on the Trophy Mountain with their herd of sheep, in the winter she trapped, often with her son, George. In the 1960’s, Ida worked for Mac and Cecile McDiarmid at their Royalite/Gulf Service Station, where Jim’s Market is now, and in later years, became care-givers to her long-time friends. Ida and Mac enjoyed berry picking which Ida turned into wonderful preserves, as well as collecting wild mushrooms. Thompson Valley, and her never ending quest to preserve nature for future generations. documented and photographed one undiscovered site on Adams Lake. hours on back roads, locating historical places such as the Japanese Tea House near Blue River. herself (while her other babies were sleeping! Her biggest fear was them waking up!) in September, 1961 giving birth to her youngest daughter, Tina without a phone, hydro, or vehicle and her husband was away! She was also artistic! She created charming pictures from nature – cones, birch bark, moss, pebbles etc. She also had a poet’s ear for words, and her cards and notes would often have a poetic line. Ida was a very busy lady with all her interests. In between times, she was a member of the Women’s Institute, Chamber of Commerce, BC Naturalists, BC Archeology Society, Friends of Wells Grey and many more. She also took courses on Museums in Victoria too. Refreshments will be available but potluck finger food is also appreciated. Get your thinking caps on and maybe get up and share some of your special memories. In Memory of Ida Dekelver for a Portable Suction Machine for Forest View Place. Funeral arrangements entrusted to Drake Cremation and Funeral Services –Clearwater. BC. What a life she lived. She will always be remembered. Our condolences. What more can be said….she contributed so much to the North Thompson Valley. She was the true example of a human ‘whirling dervish’! Our most sincere condolences to all the family, Ida will live on as a true historian of our area. My sincere condolences to the family, I had the pleasure of booking a museum tour many years ago, and Ida, personally walked us around sharing her stories. I will never forget her. Joe and Carle. Irene and I are so sorry to here of the passing of a splendid lady, your Mother, Ida. Please accept our sincere condolences and know you have all been in our thoughts for many years.